This article was originally published by Mother Jones and is reproduced here as part of the Climate Desk collaboration. President Donald Trump can’t contain his displeasure with Sen. Lisa Murkowski (R-Alaska) over her health care vote, accusing her on Twitter of letting down “Republicans and our country.” His Secretary of the Interior has also reportedly called to tell her that her vote against the GOP’s revived attempt to repeal Obamacare will have repercussions for her state. In March, Secretary Ryan Zinke signed secretarial orders to reverse the federal moratorium on coal leasing. If Trump really wanted to take revenge against Alaska for Murkowski’s vote, the best way to go about it would be by becoming a Teddy Roosevelt conservationist Republican and declare drilling and mining off-limits on federal lands and waters. When we talk about Alaska’s priorities, near the top of the list is oil and gas drilling, a central part of the state’s economy and government, accounting for about one-third of its employment. Over the years Murkowski has clashed with environmentalists over off-shore oil permits, developing roads through protected wilderness areas, drilling in the Arctic National Wildlife Refuge and the National Petroleum Reserve-Alaska, along with mining in Pebble Mine—a gold and copper mine in the Bristol Bay watershed. As chair of the Senate Energy and Natural Resources Committee, Murkowski also tends to use her position to influence Department of Interior and Energy appointments. 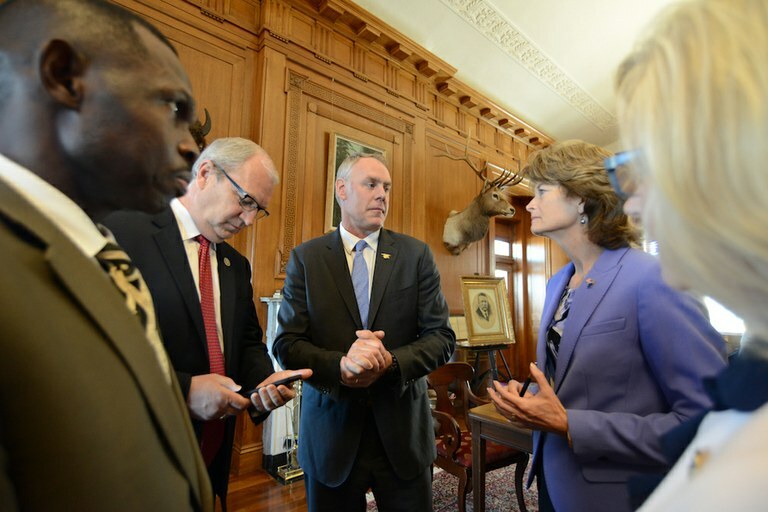 At the time of Zinke’s confirmation, Murkowski said she was hopeful he would “mark the start of a new era for the Department of the Interior that is defined by greater cooperation.” She noted how that would benefit Alaska, “which has more at stake and is more deeply affected by this Department than any other part of our country.” A Thursday meeting to consider new Energy and Interior nominees has now been postponed; no reason was given. Some of Trump’s green opponents note the irony of how in this case, his penchant for revenge could potentially make him do something good for the environment. “If, by chance, the results here should be that Trump kills fossil fuel projects in Alaska and also fails to strip health insurance from millions of vulnerable Americans, I certainly wouldn’t be upset,” Seth Gladstone, a spokesperson for Food and Water Watch, said in an email.